The paraboloid carries – only on one side – one or more concentric circular sectors to the paraboloid that slide on guidas – circular arc shaped – so as to be revolving to the North-South and East West axes of the concentrator at the speed of 15° and solar declination of +- 23° 27’. Therefore it’s a simpler structure and like the above said it’s equally steady. of the "Reformer" for hydrogen production, combined with fuel cells for the production of electric power. The Stirling motor works with external heating, and in this particular instance, it can use as heat sources: solar energy and the energy produced by the combustion of a gas, so as to assure regular working to the system, either during passing clouds or after the sunset. The fuel cell is an electrochemical generator in which hydrogen and oxygen react and continuous electric power, water and heat are obtained from them. Rankine cycle motor the system works all day long because it's fed by alternative sources, like biomasses, gas and oils. The hot fluid obtained by these systems is used to move a steam turbine that connected to the generator produces electric power. The fluid - chiefly based of salts - can be stored up to 550°C and used in the absence of Sun. The afore said system, can also be used for the production of process heat for the chemical industry. THERMOSOLAR SYSTEM FOR THE PRODUCTION OF HYDROGEN with the adoption of the "Reformer" (fig. 2). As it is well known the Reformer is a chemical process with which it's possible to extract and purify hydrocarbon hydrogen as: methane, methanol and other with modest emission of CO2. The hydrogen obtained is used in the fuel cells to produce electric power. 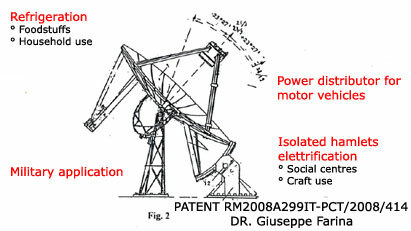 The caracteristic licensed mechanic structure allows the adoption of any high solution power diameter, to obtain a better captation of electromagnetic waves coming from the far off cosmos. Actually the greatest orientable paraboloid altazimutal mounting is the one in Effelsberg (Germany) with a diameter of a 100 meters. The planet punctuation occurs by a sophisticated computer that needs an expensive running. With the "equatorial mounting" structure proposed it's possible to realize a 200 meters diameter paraboloid more reliable than the Effelsberg's one with structure movement by a simple logic control system. It's suitable for a "service station by satellite" to satisfy the growing needs in the telecommunication field.